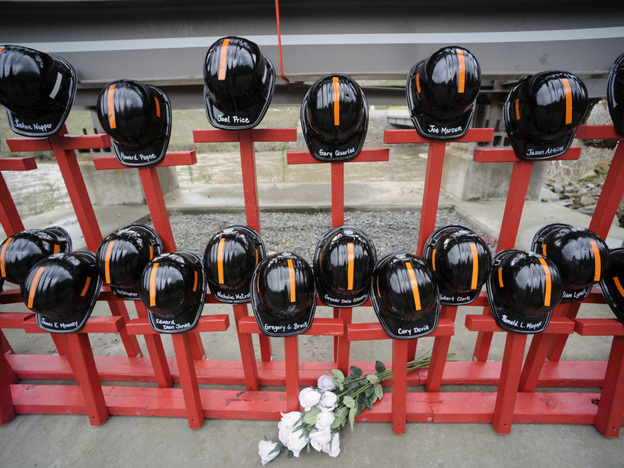 Mine helmets and painted crosses were placed at the entrance to Massey Energy’s Upper Big Branch coal mine as a memorial to the 29 miners killed there. Today in federal court in Beckley, W.Va., former Upper Big Branch coal mine superintendant Gary May was sentenced to 21 months in prison and ordered to pay a $20,000 fine. The sentencing was part of a plea agreement in which May is cooperating with federal prosecutors as they continue to investigate the April, 2010, explosion that killed 29 coal miners at Massey’s Upper Big Branch mine. May pleaded guilty to one count of conspiracy and admitted to ordering a company electrician to disable a methane monitor on a mining machine so it could continue to cut coal without automatic shutdowns. The monitor is a safety device that senses explosive amounts of methane gas and automatically shuts down mining machines when dangerous levels of gas are present. The incident was first reported by NPR in July, 2010. May also pleaded guilty to deceiving federal mine safety inspectors and hiding safety violations. Prosecutors indicate they’re aiming higher up the corporate ladder, targeting former Massey managers and executives. David Hughart, a former president of a Massey mining subsidiary has also entered into a plea agreement. Just as May’s sentencing hearing concluded, the federal Mine Safety and Health Administration (MSHA) toughened and streamlined a regulation that had rarely been enforced and could have helped prevent the Upper Big Branch tragedy, according to disaster investigators. MSHA calls it the “pattern of violations” rule and it’s supposed to identify coal mines with serious, persistent and habitual safety violations and then target them for heightened scrutiny. But MSHA failed to enforce the rule in the first 33 years of its existence, in part because of a self-imposed and cumbersome regulatory step. “It was clear after Upper Big Branch that some companies were violating lifesaving mine safety requirements over and over again,” said Sen. Jay Rockefeller, D-W.Va., who has called for mine safety reforms. Investigators concluded that the Upper Big Branch mine qualified for preliminary “pattern of violations” (POV) status before the April, 2010, explosion. But regulators failed to apply the rule, blaming a “computer glitch” that has never fully been explained. The revised rule eliminates preliminary steps so that regulators will have a much easier time citing and sanctioning habitual violators of serious safety standards. The new rule also triggers automatic and immediate shutdowns of mining areas if serious and substantial violations are found in mines with POV status. “We think that this final rule will help prevent another tragedy such as occurred at the Upper Big Branch Mine,” says Joe Main, assistant secretary of labor for mine safety and health. In a news conference this afternoon, Main added that “we have a better monitoring tool in place” since the computer error that kept the Upper Big Branch mine from receiving preliminary POV scrutiny before the April, 2010, explosion. Main said that the mine’s violations data were not entered into MSHA’s computer tracking system. “I think we’re doing a much better job of managing the system,” he said.